Where are Joice Mujuru’s allies? 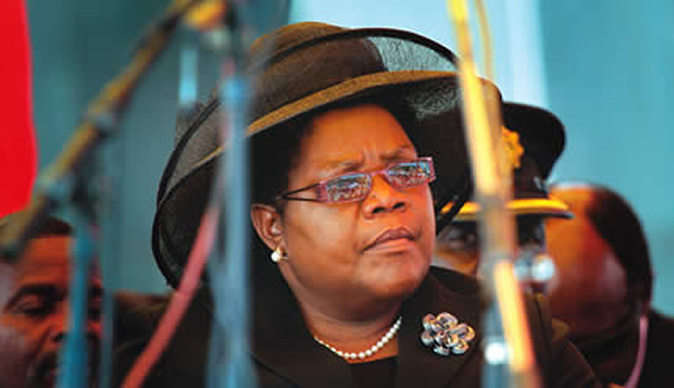 Former vice president, Joice Mujuru, has made three public appearances since her ouster and the subsequent formation of her own party. There has, however, been something glaringly amiss on all occasions: The absence of a host of notable faces that formed a wide cast of her former allies during her heydays in the ruling party. Indeed, ZANU-PF inadvertently confirmed how popular and influential Mujuru was in ZANU-PF when it expelled and suspended hundreds of its officials, including very senior ones, for hobnobbing with her. The purging wiped out over half of the ZANU-PF Politburo and Central Committee the two uppermost organs of the party as well as the Cabinet, signifying how powerful she was in both the party and government. In fact, ZANU-PF had to undergo a serious corrective surgery to mend itself after the purging spree left it severely damaged. By end of December 2014, weeks after that epoch making congress, many of these bigwigs had fallen by the wayside, including a whooping nine out 10 provincial chairpersons. When more followed in subsequent months, it was anticipated that Mujuru would end up with a leviathan of a party. But up to now, it appears, Mujuru’s political allies are hesitant to come out in the open in support of her. While a handful, notably Dzikamai Mavhaire and Kudakwashe Bhasikiti, have firmly stuck with her, even taking up leadership positions in Zimbabwe People First (ZPF), the majority of the heavyweights appear to have retreated into their shells, either hoping for a possible reunion with ZANU-PF; the ruling party has already set up an appeals committee to hear their cases, so they may be waiting on the fence to see how things would proceed. When the political Tsunami struck in 2014, several bigwigs were shunted aside for hobnobbing with Mujuru. The cast included former ministers such as Nicholas Goche, Olivia Muchena, Flora Buka, Webster Shamu, Francis Nhema, Paul Chimedza, Munacho Mutezo, Mavhaire, Bhasikiti, Tendai Savanhu, Chiratidzo Mabuwa, Tongai Muzenda and dozens of Members of Parliament and influential figures such as Ray Kaukonde, Killian Gwanetsa, Enoch Porusingazi, and David Butau among many others — all of whom were either expelled or suspended from the ruling party for backing her. So far, at her three public gatherings — namely the official announcement of the party formation early this year and her two rallies in Bulawayo and Harare — all she has presented is a motley collection of hangers on. Save for the likes of Rugare Gumbo, Didymus Mutasa, Bhasikiti and, to an extent, Agrippa Mutambara, Mujuru has people like Kudzai Mbudzi, Jealousy Mawarire, Bright Matonga, Sylvester Nguni, Munyaradzi Banda, John Mvundura and others who are evidently desperate for a turnaround of their political fortunes. The usual suspects have not turned up, much less on the side of women where only Home Affairs Minister, Ignatius Chombo’s ex-wife, Marian, is the only notable face out of a wide pool of her former ZANU-PF allies. It could be argued that Mujuru might have been forsaken by former Politburo members Muchena and Buka and Central Committee members Constance Shamu, Joyline Porusingazi, Angeline Matambanadzo and Hazel Chinake, among many of the women who were at the receiving end of incessant hateful criticism for associating with her. On the male front, Goche, Shamu, Nhema, Kaukonde, Butau and Muzenda, have all remained in their shells, never publicly associating with her. This could have fatal consequences on Mujuru’s presidential ambitions, or even on her former spineless comrades in arms’ own political future, if, by some incredible fluke, Mujuru happens to successfully turn the tables on ZANU-PF. Some, like Kudzai Chipanga and Shadreck Mashayamombe, have even crossed the floor and rejoined ZANU-PF. While those who are still serving as legislators on a ZANU-PF ticket can be forgiven for wanting to keep their seats and see their terms through, it is quite a mystery why some of those with just about nothing to lose have failed to come out in the open. Sarah Mahoka, the excitable ZANU-PF women’s league secretary for finance, this week taunted Mujuru saying she couldn’t fool women. “You see she is only being followed by men. Women have refused to be fooled and they are sticking with their party. They are wiser and loyal to the President,” she said. Political analyst, Alexander Rusero, said many of Mujuru’s allies are finding it very difficult to join her new party since they benefitted so much from the complex patronage system which President Mugabe operates. “We are talking of people who got farms and owe their lavish livelihoods to ZANU-PF, so in as much as they might want to associate with her, those benefits naturally prevent them. What should not be lost on anyone is the fact that ZANU-PF has a culture of retribution which has seen some of its former members having their properties besieged or getting persecution. So at the end of the day, someone is bound to just say I better stay quiet and enjoy my share,” he said. “However, we could see some of those people streaming to Mujuru’s party in the coming months if she manages to convince them,” he predicted. Mujuru has herself vowed to keep the momentum, lining up a series of rallies in provinces leading to ZPF’s inaugural congress set provisionally for October. Some ZPF officials are still hopeful that they will be joined by their erstwhile comrades in the period between now and October. However, political scientist, Eldred Masunungure, said the party is facing a serious challenge in that those who are MPs might find it very difficult to join the party unless they lose their legislative seats. “There are two scenarios here. One is that the MPs are hoping to hold on to their constituencies and they are not prepared to voluntarily relinquish them. They could join her later, but time is not on their side as 2018 approaches. “The second scenario is that people are hesitant to join the bandwagon, especially in light of divisions that have been reported in recent weeks and want to study the situation before they can make their minds. But, again, whoever will decide has to do so before congress, before important positions get occupied,” he said. What is, however, definitely clear is the fact that the next few months will be very interesting in ZPF.